How often does one cite something 50 years old for inspiration? How about 22 years old? Yet that is exactly what Michigan-native Kelli Fitzpatrick does with Star Trek and specifically Voyager. The 29 year-old high school English teacher uses lessons learned from Captain Janeway in her classroom, as well as the franchise’s overall theme of hope and peace in her daily life. Therefore, it is only fitting that Star Trek afforded the aspiring novelist an opportunity to travel to a new frontier – that of a published author, with her inclusion in Simon & Schuster’s Star Trek: Strange New Worlds anthology last fall. Discovering new writing talent is just one of the goals of the Strange New Worlds writing contest, which originally ran from 1998-2007, and has launched the careers of over a dozen new authors, including acclaimed Star Trek novelist Dayton Ward. By reintroducing the contest in 2016, Simon & Schuster may be on the cusp of finding the next generation of notable authors, which Fitzpatrick seeks to be among. As evidenced by her Next Generation short story, “The Sunwalkers,” Fitzpatrick appears well on her way to realizing that goal. Set during season seven of TNG immediately after “Journey’s End,” Dr. Beverly Crusher deals with the emotional fallout of her son’s unexpected departure. However, Fitzpatrick’s story is not so cut and dried, as Crusher is also presented with a medical emergency on Shar-Mi’la Prime that will require her best work yet while she attempts to operate under the specter of Wesley’s absence. “The call for submissions asked for stories that filled gaps in the existing Star Trek narrative,” Fitzpatrick explained. “One piece of the TNG series arc that I always wondered about was how Dr. Crusher dealt with the sudden departure of her son. I wanted to explore that very human reality of dealing with loss and uncertainty while having to continue with one’s career and other responsibilities. “The character of Dr. Crusher has always inspired me in her strength, compassion and professionalism,” Fitzpatrick continued as she elaborated on why she picked this subject. “Though I went into teaching instead of medicine, her integrity and absolute devotion to those in her care has always struck me as a great model for how to serve others. Gates McFadden was also the first Star Trek actor I ever met, and I’ll never forget her graciousness. When it came time to choose a character to step into for my story, it had to be Crusher. “There’s something special about writing for a world that you know really, really well and that you love. Being able to take some of the characters that I know so well, and add my own creative twist to their story was exciting, but also a challenge. In the television shows and films you have visuals and sounds, all these things that can help viewers recognize these characters. In a book, you just have words. You have to nail that character’s attitude and demeanor. Writing a novel about a show and characters one loves is not as simple as it seems. Fitzpatrick has demonstrated quite a knack for capturing the character’s voices while also penning an enjoyable and engaging story – which is no easy feat. Even though she does not yet have name recognition like Ward or David Mack to help convince the public to read her story, she does have the built in audience Star Trek offers, a moment she does not waste. “I wrote a story that I wanted to read, that appealed to me,” Fitzpatrick said. “I chose a point in the series with a character that really resonated with me emotionally. That specific plot arc meant something to me. I also tried to think about the fan base at large, and what sort of story they would like to read, what episode would fit nicely into the canon that is already there. Counting the overall message of Star Trek as one of hope and peace makes sense for Fitzpatrick, who as a teacher attempts to convey that idea in her classroom on a daily basis while assisting students in working through interpersonal struggles. Yet, whether she realized it or not, she also captured another major theme of the franchise – exploration, specifically in the human condition in her short story. Lessons are something every teacher needs to come to class prepared to execute daily. Fitzpatrick’s students may be surprised to learn that ideas she assimilated while watching Voyager are evident each day in her classroom. Many women chalk up Janeway’s scientific prowess as a reason for entering that world as adults. But Fitzpatrick took away a more obvious example that Janeway provided every episode – leadership. Our heroes often affect the way we choose to live. For Fitzpatrick, the idea that Star Trek was about hope and peace is something she considers in her daily life through every interaction she encounters. This message and the way it was achieved in Star Trek is especially relevant in today’s turbulent climate in the United States, with so much of its population divided. It really is a lot like a Star Trek episode in that people from different cultures and ideologies have different ways of viewing the world. “One of the driving messages behind Star Trek is that peace wins. Always go the peaceful route first. The Enterprise never fires first, is not out to dominate other cultures, and they respect everyone and try to help in the best way possible, and I think that is a really great way to live your life. Star Trek has also assisted Fitzpatrick in her classroom in an unexpected way, as the rigors of the Strange New Worlds contest allowed her to relay those lessons to her students – especially those in her after-school writing club, several of which have serious aspirations to become published authors. Currently in only her fifth year as a teacher, Fitzpatrick has seemingly proven in a short time that she has what it takes to make an impact in the classroom for the long run. 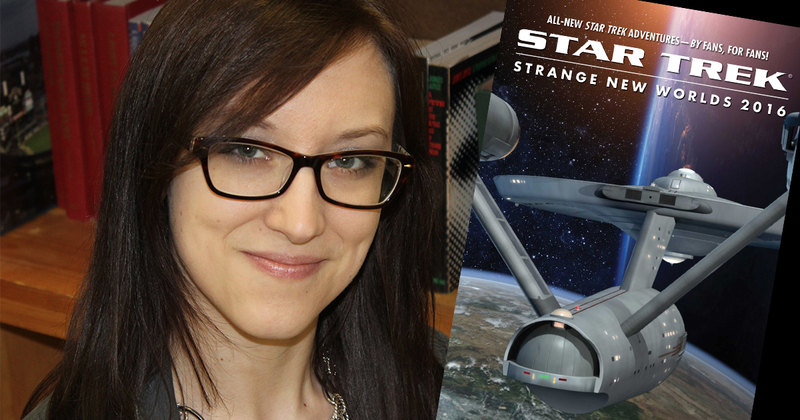 Using the lessons Star Trek has taught her, the newly-published author serves as an inspiration to her students (and readers). Hopefully she will continue to inspire throughout what is shaping up to be a long and fruitful career in teaching and writing. Kelli Fitzpatrick can be found at kellifitzpatrick.com and on Twitter @KelliFitzWrites. Star Trek: Strange New Worlds 2016 anthology is available as an e-book via iTunes and Amazon. Congratulations! I’ll be sure to check out your story. Dr. Crusher’s lack of response to Wesley leaving always puzzled me. I’m looking forward to reading about how she dealt with it. It’s interesting to learn that you brought your passion for Star Trek into the classroom. It truly puts the aspect of having passion for what you do into perspective. I’m so proud to be your student. You’re one of my role models Mrs. Fitz and I hope I can reach my goals like you have. I hope I can reach my goals like you one day.